The Vietnam War occurred in Vietnam, Laos and Cambodia from 1959 to April 30th, 1975. The war was fought between the communist North Vietnam, supported by its communist allies, and the government of South Vietnam, supported by the United States and other member nations of the Southeast Asia Treaty Organization (SEATO). The Vietcong, the lightly armed South Vietnamese communist insurgency, largely fought a guerrilla war against anti-communist forces in the region. The North Vietnamese Army engaged in a more conventional war, at times committing large-sized units into battle. 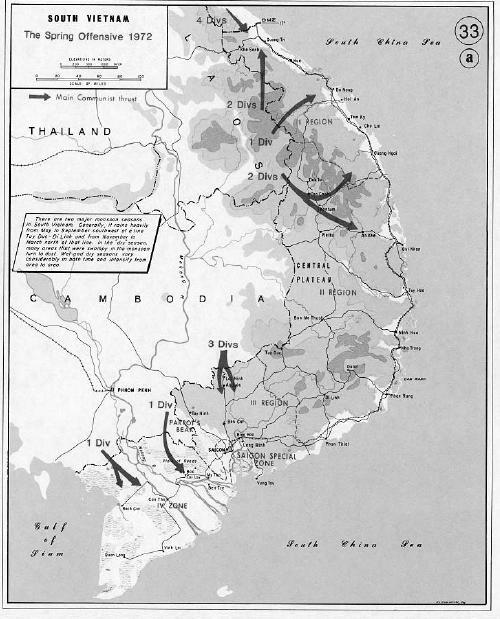 U.S. and South Vietnamese forces relied on air superiority and overwhelming firepower to conduct search-and-destroy operations, involving ground forces, artillery and air strikes. The Case-Church Amendment passed by the U.S. Congress prohibited use of American military after August 15th, 1973, unless the president secured congressional approval in advance.The capture of Saigon by the North Vietnamese army in April 1975 marked the end of the Vietnam War. North and South Vietnam were reunified the following year. The war exacted a huge human cost in terms of fatalities (See: Vietnam War casualties), including 3 to 4 million Vietnamese from both sides, 1.5 to 2 million Laotians and Cambodians, and 58,159 U.S. soldiers. By this war's end, the Vietnamese had been fighting foreign involvement or occupation in various wars for over a hundred years.